101. The level of sector financing from tariffs, taxes, and transfers varies widely from country to country, with EU members showing the highest per capita financing. Availability of data about sector financing is scarce in some countries, but an analysis of publicly available data from a variety of national and international sources indicates a wide variation from country to country, with EU members showing by far the highest amounts of per capita financing, all sources included (Figure 48). Many of the countries are also in the lower range of the generally accepted value for overall sector financing as a share of GDP of around 0.35 percent to 1.20 percent (high-income countries), 0.54 percent to 2.60 percent of GDP (middle-income countries), or 0.70 percent to 6.30 percent of GDP (low-income countries) (OECD 2006). 102. 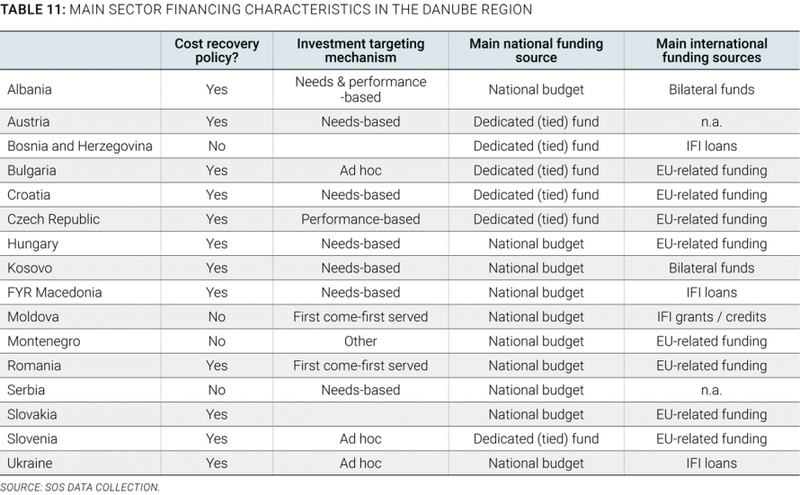 The structure of financing of services in the region varies widely from country to country, but investments are generally supported by public funds and external transfers, while operational expenditures are mostly covered from utilities’ own tariff revenue. The shares of overall sector financing stemming from transfers is generally higher for new EU members due to the strong financial impact of EU funds; conversely, for most of those, the share financed from tariffs is relatively low—an interesting finding in view of the WFD’s cost recovery requirement (Figure 49). The share of financing coming from taxes—either through direct investment or operating subsidies, or through the reimbursement of IFI commitments and other loans—is relatively constant at between 10 percent and 20 percent across most countries, representing around 0.1 percent of GDP, with the notable exception of Montenegro and, to a lesser extent, Albania and Kosovo. Contrary to other regions, water sector expenditures do not represent a significant fiscal burden on most national governments, which rely instead on transfers when available (most often from the EU) and tariffs as the main instrument to recover sector costs. This finding is consistent with the strong role played by local governments in the provision of services, shown in Chapter III, and shows the limited leverage national governments have over the sector. 103. Despite the widespread adoption of the cost recovery principle in national legislation, only two countries—the richest and the poorest—rely on tariffs to finance around 90 percent of the sector. As shown in Table 11, the vast majority of the countries in the region have inscribed in their national legislation the principle of cost recovery. The reality, however, is quite different. In Austria and Moldova, the absence of EU funding and limited fiscal space mean that around 90 percent of sector financing comes from tariffs. In most other countries, taxes and transfers represent between 25 percent and 75 percent of the sector’s overall financing, which as long as access and consumption is relatively even, means subsidies are spread evenly or are income neutral. However, that financial support becomes a regressive public expenditure when access to public services is not evenly shared, so that only those with public services are reaping the benefits from that public spending. Since richer households typically use more water (having more appliances, like washing machines or dishwashers), consumption is also rarely even, and public spending therefore disproportionately reaches households with higher water consumption. In contrast, when public spending is targeted to address existing access gaps or affordability constraints (as will be discussed later), such spending could become more progressive. 104. 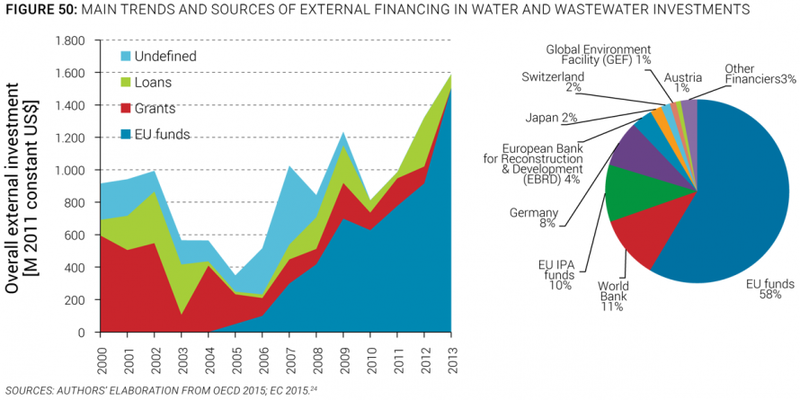 Few countries have developed a dedicated water sector financing mechanism providing predictable funding. In most countries, investments are financed from external transfers or ad-hoc IFI-supported loans repaid by state or local government budgets. While many countries partly finance the sector’s investments from their national budget, about a third of the countries have a dedicated mechanism to finance investments (Table 11), guaranteeing more predictable funding. One such example is Croatia, where water extraction rights and wastewater discharge fees are managed by the national water agency and finance €70 million in annual investments (see Table 4 in Chapter III for more details). However, even in countries with such schemes, the decisions on the use of funds are often somewhat arbitrary and are not necessarily directly linked with the sector’s policies and strategies. Not surprisingly, in all EU member countries and the more advanced candidate countries, EU-related funding (Cohesion Funds, regional policy funds, Instrument for Pre-Accession [IPA] funds) represent the majority of external financing to the sector, while in other countries, IFI and bilateral donors continue to play the main role. 105. EU Funds now represent a large majority of external financing in the region and have displaced other traditional lenders. Although it is challenging to obtain an accurate overall picture of investment flows into the region, an analysis of OECD and EU data shows that overall external investment funding has grown in the last 15 years (Figure 50). Much of the growth is due to EU funds, which are limited to 8 of the region’s 16 countries, and the funding has displaced to some extent traditional lenders such as IFIs and bilateral donors, which were providing high levels of funding particularly in the western Balkans following the conflicts in the 1990s, but gradually moved out as the EU funds and IPA funds became more important. A comparison of publicly available information about EU funds going toward the sector and actual investments shows, however, that in most of the EU countries, EU funds represent only a limited part of the overall investments, ranging from around 10 percent in the Czech Republic (where the private sector absorbs most of the needs) and 30 percent in Romania, to a much higher value of around 60 percent in Bulgaria.